The 2019 Best in Snow Skijoring Race result are in! GDNS and the North Superior Ski & Run Club will host a day of cross country and skijoring races at the Pincushion Mountain Trail system in Grand Marais, MN. A 3 km and 7 km skijoring race will be offered in the afternoon. There is a one dog max per skier. Send us an email at godognorthshore@gmail.com for details! GDNS, Cook County Dog Mushers Inc. and Trail Center Lodge will offer a day of dog sled derbies and skijoring races on beautiful Poplar Lake! There will be a 2.5 mile and 5 mile race with a 2-dog max per skier. All ski levels and ages welcome! GDNS will once again partner with the North Superior Ski & Run Club to offer a 7 km and 3 km skijoring races at the 2018 Winter Family Festival. The event will take place on the immaculately groomed Pincushion Mountain Trails above beautiful Grand Marais, MN. On-site registration. Go Dog will also host another race as a part of the Dog Days of Winter on March 11th on beautiful Poplar Lake. There will be two races offered, a 2.5 mile race and a 5 mile race. There is a limit of two dogs per skier for each race. The event will also offer three dog sled races of varying length. Follow the Dog Days of Winter Facebook page for updates. GDNS will once again partner with the North Superior Ski & Run Club to offer a 7 km and 3 km skijoring races at the 2017 Pincushion Winter Carnival. The event will take place on the immaculately groomed Pincushion Mountain Trails above beautiful Grand Marais, MN. Registration information and details will posted in the the coming weeks. Go Dog will also host another race as a part of the Dog Days of Winter on March 12th on beautiful Poplar Lake. There will be two races offered, a 2.5 mile race and a 5 mile race. There is a limit of two dogs per skier for each race. The event will also offer three dog sled races of varying length. Follow the Dog Days of Winter Facebook page for updates. Go Dog will also host another race as a part of the Dog Days of Winter on March 13th on beautiful Poplar Lake. There will be two races offered, a 2.5 mile race and a 5 mile race. There is a limit of two dogs per skier for each race. There is a $10 entry fee for the 2.5 mile race and a $15 fee for the 5 mile race. Follow the Dog Days of Winter Facebook page for updates. Go Dog will once again partner with the North Superior Ski and Run Club to offer the 2016 "Best in Snow" on February 14 at the Pincushion Mountain Ski Trails in Grand Marais, MN. We will offer a 3 km race and a 7 km race with classic and skating options available for each race. There is a limit of one dog per skier for both races. Registration will be available on site from 2:00 pm until 2:45 pm. Races will begin at 3:00 pm. We will provide a 30 second interval start. There is a $10 entry fee for the 3 km race and a $20 fee for the 7 km race. The results from Go Dog North Shore's 2015 "Best in Snow Skijor Race" are in! Enjoy these beautiful images captured by Tofte, Minnesota photographer Tom Spence at the 2015 "Best in Snow". Go Dog North Shore in partnership with the North Superior Ski and Run Club will host the 2015 Best in Snow Skijor Races at the Pincushion Mountain Ski Trails in Grand Marais, MN on Sunday, February 15th. This year, a non-competitive 3 km race will be held on the East and West Overlook Loops and a 7 km, 1-dog free-style competitive race will be held on the Pincushion Mountain Loop. 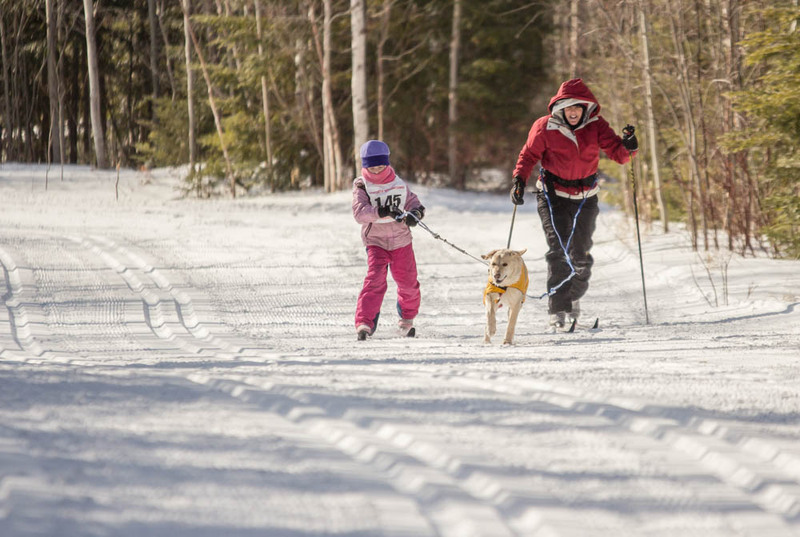 These impeccably maintained cross-country ski trails are normally off-limits to dogs but an exception has been made in order to create this fantastic skijor race. The race is a part of the newly created Pincushion Mountain Winter Festival. Final Results from the 2014 "Best in Snow"! Go Dog North Shore is pleased to announce the first ever “Best in Snow Skijor Race” to be held Saturday, March 1st, 2014 at the George Washington Pines Ski Trail outside of Grand Marais, Minnesota. The “Best in Snow Skijor Race” is a fun event that celebrates our relationships with our dogs, encourages us to live active lifestyles with our dogs, utilizes local dog-friendly ski trails, promotes the sport of skijoring and fosters partnerships with local business’s, non-profits, government agencies and individuals. The event will feature two timed races; a two mile race and a four mile race. Each race will be capped at fifteen teams. Teams are limited to one dog per skier. The “Best in Snow Skijor Race” will be held in conjunction with the Sawtooth Mountain Clinic’s community-wide active living campaign “Move It” during the month of February. Local skijorers are encouraged to participate in “Move It” as a way to prepare for the “Best in Snow Skijor Race” on March 1st. Prizes will be awarded to the top teams in each race. Skijoring is a winter sport where a person on cross-country skis is pulled by a dog. The “Best in Snow Skijor Race” is a fundraiser for Go Dog North Shore and is geared towards experienced skijorers as well as beginners. Go Dog North Shore is a new non-profit organization based in Grand Marais that aims to promote healthy and active human and dog relationships on Minnesota’s North Shore of Lake Superior. Contact Cathy Quinn at (218) 370-9494 or quinn@boreal.org for more information about the “Best in Snow Skijor Race” including details on registration and volunteer opportunities. Registration Forms are available for download here.